1. Contrary to popular belief, orangutans are great apes, not monkeys. They share about 97% of the same DNA as humans. 2. The gestation period for female orangutans is 8.5 months. 3. There are approximately 900 orangutans living in captivity with between 19,000 and 25,000 living in the wild. 4. In the wild, orangutans can live between 35 and 40 years. In captivity, they have been recorded to live between 50 and 60 years. 5. The diet for orangutans consists mainly on figs and other fruits. They also feed on insects, bird eggs, vegetation, leaves, tree bark and small animals. 6. The biggest threat to orangutans is deforestation, mainly through excessive logging. Many of the female orangutans are also killed so their young offspring can be illegally taken so they can be put into zoos and circuses. 7. 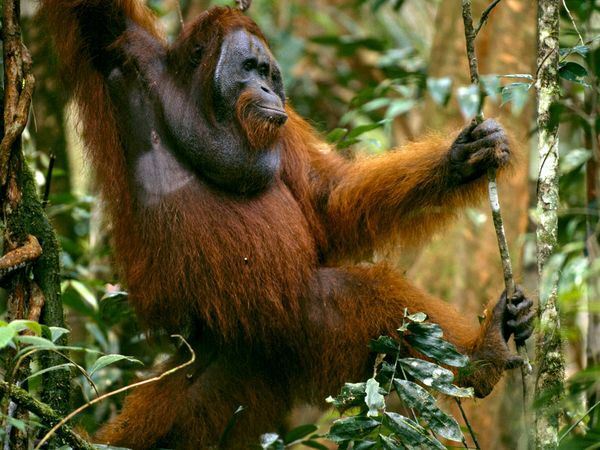 Orangutans are mainly found in Asia and also on the islands of Sumatra and Borneo. They prefer to stay in the lowlands and the tropical rainforests. 8. Orangutans are the largest mammals in the world that live in trees. 9. The orangutan’s feet are very much like their hands. In fact, some say that they have four hands rather than two feet and two hands. These appendages help them swing through trees gracefully. However, it makes it awkward for walking on the ground. 10. In a standing position, orangutans measure between 4 and 5 feet on average. They can also range from 70 to 180 pounds. 11. The average arm span for an orangutan is 7.5 feet. Because their arms are so long, they can generally reach their ankles without bending over. 12. An orangutan’s skin is actually a grayish-black color. Their hair is reddish-brown. 13. Male orangutans take no part in raising or nurturing their offspring. The mother does this exclusively. 14. Female orangutans often have their first offspring around the age of 14 or 15. 15. The main predators for orangutans include tigers, leopards, crocodiles and wild dogs. 16. Orangutans tend to be solitary animals. Typically, they only like to be with other orangutans is when they are mating. Young orangutans will play with each other, but the adults generally ignore each other. 17. Female orangutans will only have an offspring once every 8 years. This is the longest span between births for any mammal in the world. Their offspring will stay with the mother for about the first 6 to 10 years of their life. 18. Some researchers believe orangutans to be more intelligent than chimpanzees. Several orangutans have even been taught how to use sign language. 19. Orangutans have 32 teeth, which is the same number of teeth that adult humans have. 20. Orangutans are believed to be seven times stronger than humans. 21. Male orangutans make loud calls that can echo through the forest in order to locate females for mating or to warn other males about their presence. 22. Most of an orangutan’s daily life is spent looking for food. 23. As the nighttime hours get closer, the orangutan will begin to construct a new nest made from branches and leaves in the trees. They will curl up in their nest, which can be as high as 100 feet in the trees, much like people curl up in bed for the evening. 24. As male orangutans get older, their throats begin to develop a pouch and their face begins to grow cheek pads. 25. Baby orangutans are very similar to human babies. They whimper when they are hurting, they smile when they are happy, and they will cry when they are hungry.